For perfect Butter Prawn dish, I would recommend Delichef seasoning powder - just follow the instruction on the packet (to add Bird-eye chillies & curry leaves). 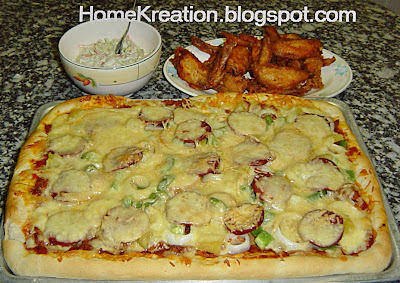 I also added some mozarella cheese for cheesy taste. This Chocolate Waffles is very rich in taste & texture like brownies....my kids just love it! Original recipe is by Hershey but I have simplified it a bit. 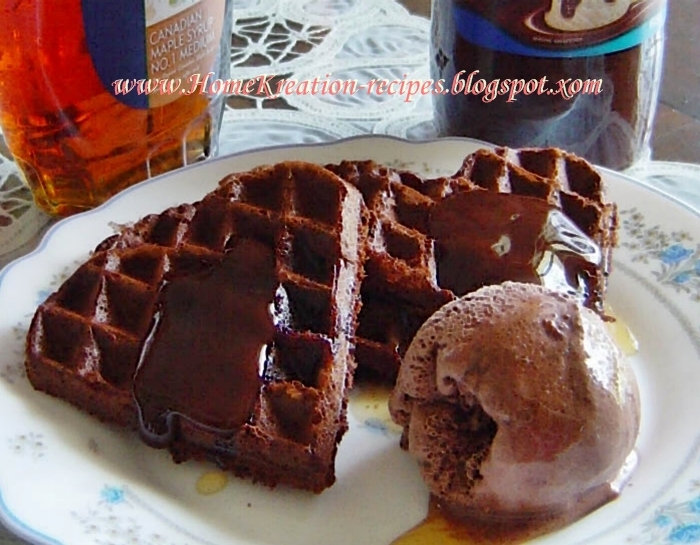 Serve with your favourite syrup & icecream or simply delicious by itself. 1. 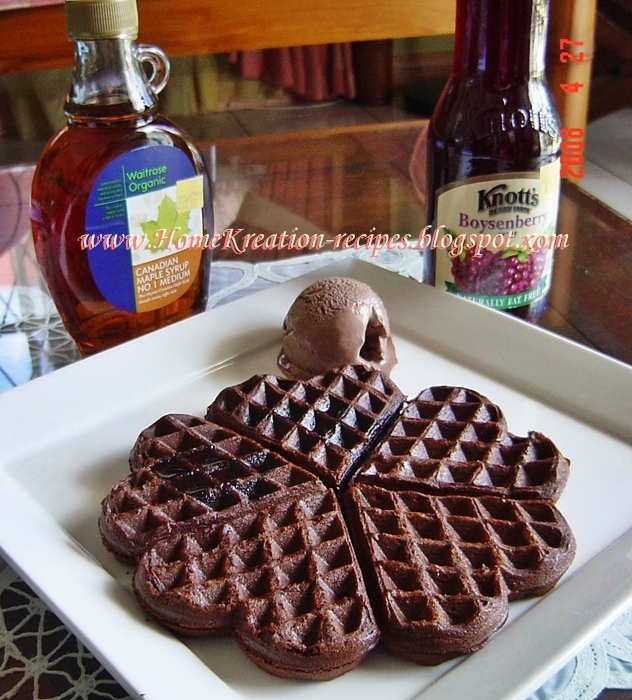 Preheat waffle maker (WM). 2. Mix Cocoa, Butter & Sugar. Add Flour mixture alternating with Milk. 3. Pour into WM & cook per manufacturer instruction. 4. Serve with favourite sauce like maple syrup, fruit syrup, chocolate sauce, custard, icecream...etc, etc per your imagination. Bubur Kacang Durian is green/mung beans cooked in Coconut Milk and flavoured with Durian. The Bubur I made today is served wth steam glutinous rice. It can also be served with Roti Jala. Since this is a very common dessert in Malaysia, I don't post the recipe. 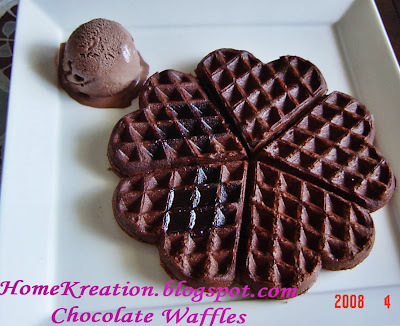 In case anyone interested for the recipe, please shout. Recipe was requested & therefore updated herewith. 1. 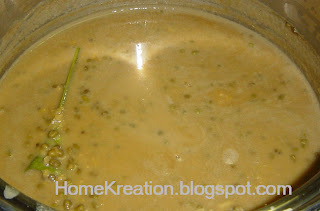 Wash mung beans & boil with a lot of water until soft & water dried up. Add in the rest of ingredients & boil. The moment it is boiled, off the heat. 2. 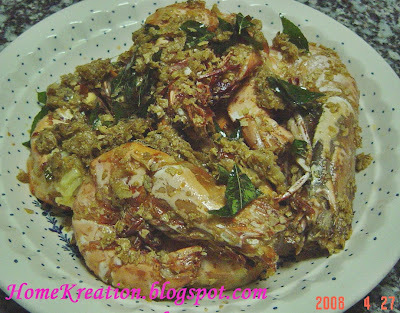 Serve with steamed glutinous rice, Roti Jala, bread or just by itself. 1. Prepare bread dough & line pizza tin. Bake for 10 minit. 2. Fry chopped onion, garlic for 2 minutes and then add chilli paste & fry until fragrant. Add minced meat, sauces and the rest of ingredients. Stir & cook until meat is done and the sauce become a bit dry. 3. Spread bread with tomatoo puree. 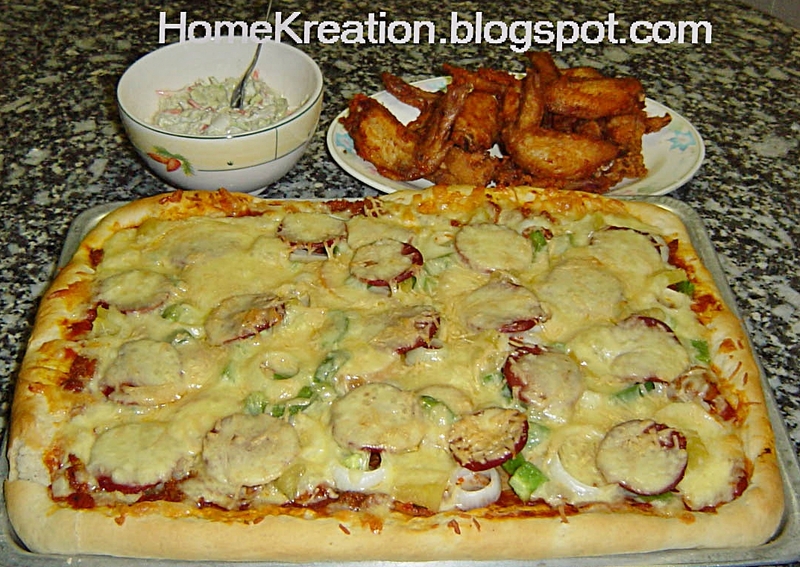 Top with cooked meat & the remaining toppings. Sprinkle cheese at the last step. 4. Bake at 180C for 20-25 minutes. 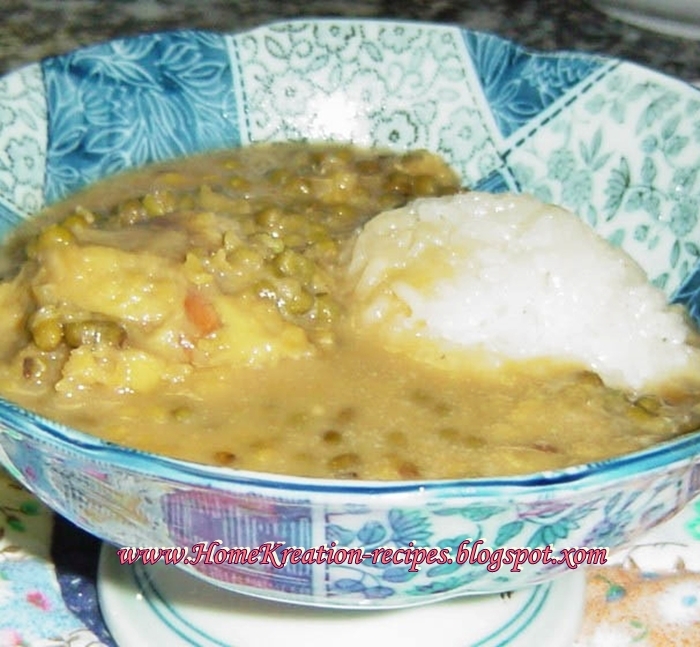 The first time I tasted banana trunk curry was at a friend's gathering. It is amazing that banana trunk can really be turned to something delicious. I did not have enough of it even after my second plate of rice. Last weekend I decided to sacrifice my banana tree to satisfy this inner craving for the tasty banana trunk... can you imagine? I experimented carefully by selecting the most inner part of the trunk which is soft enough to turn into vegetables. Since I did not have shrimp in the freezer I decided to add chicken to accompany the banana trunk and it was just marvellous..! 1. Clean & slice banana trunk thinly. Place in a pot. 2. Pound/blender chillies & shallots & place in the pot. 3. Place all other ingredients in the same pot & boil. Make sure you stir all the time to prevent coconut milk from curdling. 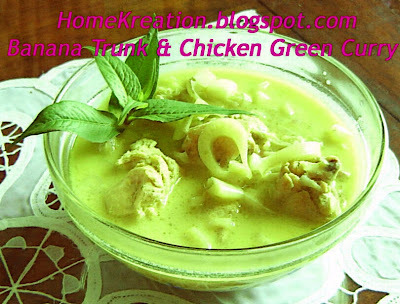 The green curry is ready when the vegetable & chicken parts are cooked. I made this last Friday for Women Network party and made it again today on my children's request. It was a hit during the party and many asking for the recipe. The original recipe is called Heart Jelly from Yochana but I changed the name because I did not use heart shaped fruit but replaced it with pineapple rings instead. I have also refined the recipe a bit the way I made it. 1. Blend biscuits until fine and then mix with melted butter and mix thoroughly. Press into a 9" Square tray. Chill in the fridge to let it harden. 2. Stir gelatine powder with boiling hot water until it is dissolved. 3. 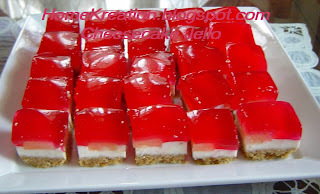 Beat cream cheese, sugar and vanilla essence till creamy, add in gelatine mixture gradually and cream until smooth. Pour on top of chilled biscuits. Arrange pineapple rings on top of cheese fillings. Put into the fridge to let it set. 4. Dissolve Jello in boiling water then pour in cold water and stir well. Let it completely cool. Pour over the set cream cheese filling and put into the fridge again to let it set until firm. NOTE: For muslims, be reminded on careful selection of gelatine as most brands are not halal. In Malaysia, you can check the product code with JAIS via sms or website on Directori Halal before buying. This morning I've tried this simple idea that I've seen somewhere. I have specified the ingredients below for 12 pieces. 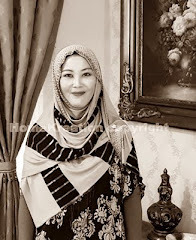 It is not just easy to prepare but also presentable to serve for guests. The bread cups are crispy and the filling can be changed to your preferred ones like tuna, sardine or mince meats but of course scramble egg is the easiest...! 1. Remove crust from sides of bread slices. Flatten bread slices with rolling pin. Spread margarine on both sides. Cut into small pieces. Press bread pieces into muffin mould. Bake 200C for 10-15 minutes until crispy. 2. Fry chopped onion & chillies and stir in beaten eggs. Add in chopped celery leaves. 3. 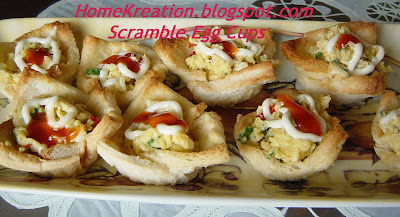 Fill scramble egg into baked bread cups. Pipe mayonaise & chilli sauce on it. Serve.